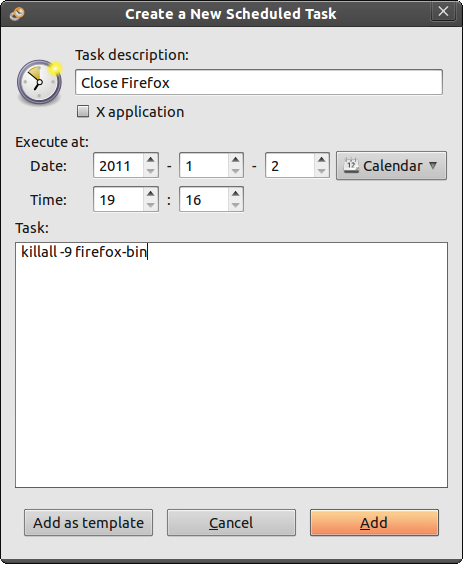 Automatically close application after custom time? Is there a way to automatically close a certain application after custom time? Update: i.e. stop the Audioplayer after a certain time. This will kill all instances of firefox at a certain date/time, you can also have reoccurring events that kill off certain programs at certain times, for instance to encourage kids to not browse the internet or for killing certain games. It is possible to do this kind of thing from the commandline too, but you need to know how to use crontab -l and how to write cron lines. Perhaps you could alias the applicaton, or change its start up, so it fires off an 'at' command as it starts. 'at' can be used to schedule one off jobs to occur later on. 'man at' should give you the info. So the next bit would be to start your process (without waiting for it to stop), grab the id, then pass that into at. $! should hold that, and ampersand will make it not wait. $* to pass through the original parameters will help too. <your process> $* & export PID=$! Not the answer you're looking for? Browse other questions tagged automation or ask your own question. How can I kill an application after a specific amount of time? How do I run a script automatically when I start an app? How can I automatically shutdown the system after a specific time? How to set up a default system configuration (packages, config)? Apply compressor effect to new podcasts automatically? Is there an equivalence to ControlPlance for Mac? Automatically minimize program after X time without focus?